Wakefield was born in Melbourne, Florida on August 2, 1966. He attended Eau Gallie High School and then attended Florida Tech. At Florida Tech, he was named the Panthers team MVP as a first baseman in his sophomore and junior years. He set single-season records with 22 home runs and 71 RBI, as well as the career home run record at 40. In 2006, his number 3 was retired by the college. Wakefield was drafted as a first baseman in 1988 by the Pittsburgh Pirates. After a scout told him that he would never get above Double-A ball as a position player with his skills, Wakefield began developing the knuckleball that has made him so well known, at the time stating "I just want to be able to say I tried everything I could to make it". With the Boston Red Sox rotation struggling from injuries to top of the rotation starters Roger Clemens and Aaron Sele early in the 1995 season, Wakefield was called up from Triple A, and soon proved to be their most dependable starter. He began the season with a 1.65 ERA and a 14–1 record through 17 games – 6 of which were complete games. He ended the year 16–8 with a 2.95 ERA, helping the Red Sox win the American League East division title, and capturing the Sporting News American League Comeback Player of the Year. He finished third in the AL Cy Young Award balloting. In 2004, Wakefield helped the Red Sox win the ALCS against the Yankees, a best-of-seven series to advance to the World Series. The Red Sox lost the first two games of the ALCS and were losing badly in Game Three when Wakefield asked to be put into the game to save the other pitchers for the next day. He pitched 3⅓ innings which prevented him for starting Game Four. Derek Lowe started Game Four in his place which the Red Sox ultimately won. In Game Five, Wakefield again pitched out of the bullpen and was the winning pitcher in a 14-inning game, throwing three shutout innings as the Red Sox won 5–4. The Red Sox beat the Yankees and went on to the World Series. He pitched Game One of the 2004 World Series but did not get a decision as Boston defeated the Cardinals, 11–9, which was the highest-scoring Game One in World Series history. The Red Sox swept the Cardinals for their first World Series title in 86 years. His 2011 season was followed in the documentary film Knuckleball!. Wakefield started his seventeenth season in a Red Sox uniform as a reliever. Injuries to John Lackey and Daisuke Matsuzaka moved him into the starting rotation. Tim met his wife, Stacy Stover, in Massachusetts. They were married November 9, 2002. Their two children are Trevor (born in 2004) and Brianna (2005). They own a home in Indian Harbour Beach, Florida. 1 2 "Tim Wakefield Statistics and History". Baseball-Reference.com. Retrieved January 6, 2011. ↑ "Boston Red Sox Top 10 Pitching Leaders". Baseball-Reference.com. Retrieved January 6, 2011. ↑ Benjamin, Amalie (October 28, 2010). "Wakefield wins Roberto Clemente award". The Boston Globe. 1 2 http://www.newsobserver.com/sports/story/1593745.html Archived July 6, 2009, at the Wayback Machine. ↑ Chass, Murray (September 23, 1994). "BASEBALL; Recalled Players Try to Get Pay Back". The New York Times. Retrieved March 28, 2010. ↑ "Tim Wakefield – 2004 World Champions". RedSoxDiehard.com. Retrieved 2014-01-19. 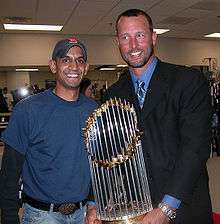 ↑ "Red Sox, Tim Wakefield agree to contract extension". MLB.com. Boston Red Sox. 2005-04-19. Retrieved 2009-06-05. ↑ Browne, Ian (September 11, 2005). "One Wakefield mistake proves costly". MLB.com. Retrieved 2007-06-19. ↑ "2008 Major League Baseball Baserunning/Situ". Baseball-Reference.com. 2009-01-01. Retrieved 2014-01-19. ↑ "Boston Red Sox – Red Sox pick up option on Wakefield – Boston.com". Archived from the original on April 16, 2009. ↑ McAdam, Sean (April 16, 2009). "Bid at no-hitter just part of Tim Wakefield's story". Boston Herald. ↑ Kenyon, Paul (April 22, 2009). "Red Sox 10, Twins 1: Wakefield goes distance in rain-shortened 7-inning game". The Providence Journal. Retrieved May 23, 2011. ↑ Benjamin, Amalie (June 28, 2009). "Wakefield on top of it all in beating Braves". The Boston Globe. ↑ Tomase, John (July 5, 2009). "Wakefield leads Sox All-Star contingent". Boston Herald. Retrieved May 23, 2011. ↑ Buckley, Steve (July 9, 2009). 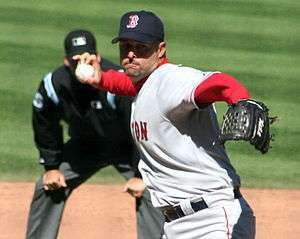 "After 11th win, Tim Wakefield deserves nod in AL". Boston Herald. Retrieved May 23, 2011. ↑ Golen, Jimmy (September 17, 2010). "Bautista hits 48th HR, Blue Jays beat Red Sox 11-9". Yahoo! Sports. Retrieved May 23, 2011. ↑ Genzlinger, Neil (2012-09-20). "The Art of the Flutter: 'Knuckleball!' Considers the Unpredictable Pitch". The New York Times. Retrieved 2013-06-02. ↑ Burr, Ty (2012-09-17). "'Knuckleball!' documentary is pitch-perfect". The Boston Globe. Retrieved 2013-06-02. ↑ "Boston Red Sox vs. Toronto Blue Jays – Box Score – May 11, 2011 – ESPN". Espn.go.com. 2011-05-11. Retrieved 2014-01-19. ↑ Rohrbach, Ben (2012-02-17). "Wake: 'The hardest thing I've ever had to do'". Weei.com. Retrieved 2014-01-19. ↑ Kaplan, Thomas (June 21, 2010). "Martinez Uses First Baseman's Mitt to Catch Knuckleballer". The New York Times. ↑ Benjamin, Amalie (July 5, 2009). "Shining, a Star or not". The Boston Globe. 1 2 "Tim Wakefield Statistics and History". Baseball-Reference.com. Retrieved 2014-01-19. ↑ "Red Sox Honor Tim Wakefield". Fenway Ticket King. Retrieved 12 March 2014. ↑ "Tim Wakefield Returns to the Red Sox as Honorary Chairman of the Red Sox Foundation and Special Assignment Instructor". Boston Red Sox. ↑ "Former Red Sox Knuckleballer Has New Pitch Bank Spokesman". ↑ "Tim Wakefield's wife Stacy Stover". PlayerWives.com. 2002-11-09. Retrieved 2014-01-19.